In celebration of See You in Iran reaching 100k members we relaunched “Hangouts,” our free, interactive cultural outings. For our fifth Hangout we explored Golestan Palace and with both our Iranian and foreign participants explored modern Iran’s contentious history of westernization. By October 2015 the See You in Iran Facebook group had evolved from a forum to a community. Comments were including messages of support. Posts were intiating dialogue. Members were interacting like acquainted allies. The online platform was growing, but was the scope of alternative virtual connections was limited. 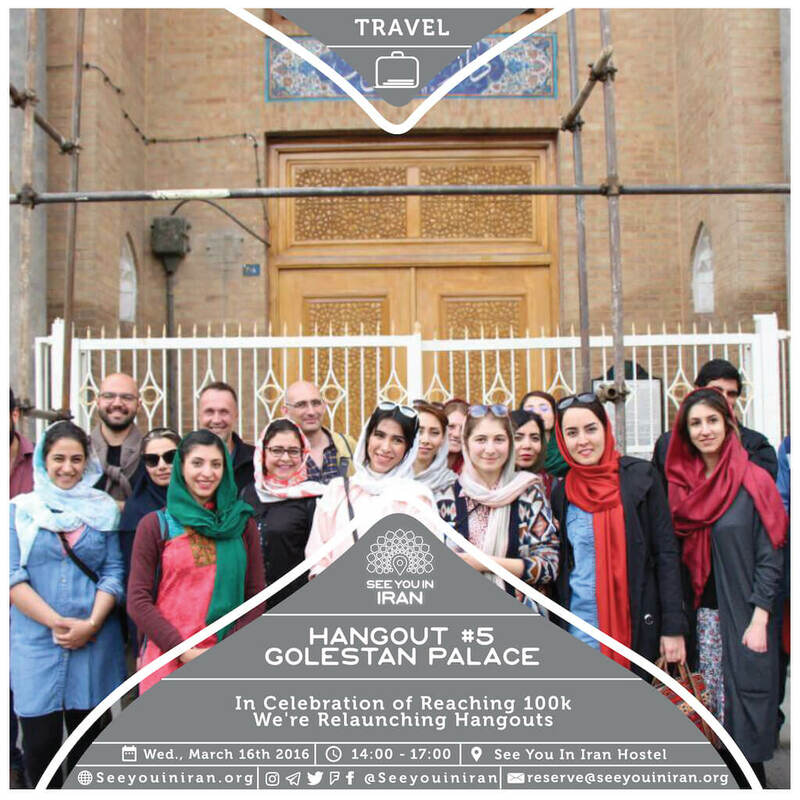 In hope of expanding the spaces through which the Facebook group community members could connect, the See You in Iran admin team launched “hangouts.” They are See You in Iran’s free and interactive cultural outings for locals and travelers. They are also the predecessors to the Cultural House, and the first face-to-face materialization of its online space. In less than three months See You in Iran organized four “hangouts” and the community started was thriving offline. In March 2016 in celebration of the Facebook group reaching 100k members a fifth “hangout” was organized. In it participants explored Golestan Palace and delved into modern Iran’s contentious history of westernization. Previous “hangouts” at Bam-e Tehran, the Grand Bazaar, Niavaran Palace and Emarat-e Masoudieh focused on interactiveness and inclusivity. While the fifth “hangout” was a relaxed outing with an ongoing conversation about the affects of westernization on Iranian society, it was the end of “hangouts” at mainstream tourist sites and the beginning of critical socio-cultural programming.